So it’s tough enough to handhold an HDR image, but given a choice between handholding and aerial HDR – I choose handheld. Even with the 3-axis gimbal guiding the camera, the aerial cam just can’t hold still enough. I probably spent about 20 minutes trying to eliminate all the ghosting in this image (and could have easily spent another 1/2 hour). Enough’s enough. This will have to do. I think I’ll just stick to the one image post-processing using the raw data straight out of the camera. I just realized that was an incredible amount of technical geek-talk. It’s late at night – thanks for listening. Now just enjoy the image. 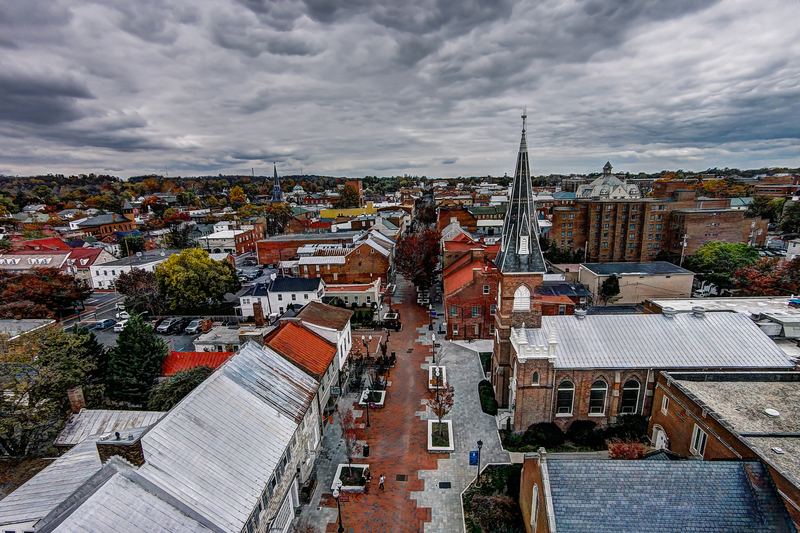 Fall On The Mall – Old Town Mall in Winchester, VA.